The following is an excerpt from an essay that first appeared in the American Orchid Society BULLETIN (what later became the current Orchids Magazine) in March 1981; the second in a many-part series on orchid growing for the beginner. At that time, the Society was headquartered at Harvard University, hence the references to the Cambridge offices. While much has changed in the intervening 28 years, including the society's headquarters, the general message remains the same. You may have some difficulty, as I did, accepting the fact that orchids can be grown successfully under artificial light. The almost eerie gleam of fluorescent tubes seems far removed from the dynamic, natural environment in which orchids have evolved. To me, the whole idea suggested scenes from those futuristic science-fiction movies in which space-colony pioneers grow plants under artificial "suns" for survival in the void of black space. It was also hard to imagine sun-loving plants like orchids flowering under the relatively low light intensities of conventional fluorescent tubes. But flower they do. What fluorescent lights lack in intensity, they can compensate for in daily light duration and in numbers. After growing orchids under lights, and some research into what others with much more experience have written and done, I can now say that I am convinced. The large numbers of "under lights" hobbyists is ample evidence in itself that artificial light is a fruitful means of growing orchids. 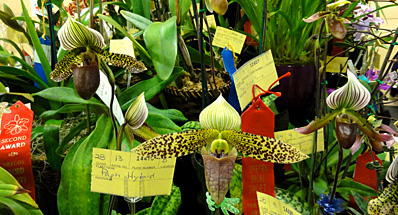 Not only do many hobbyists consider growing their orchids indoors under lights an acceptable alternative until warmer weather returns in the spring, but a substantial proportion find the more controlled conditions and relatively minor costs of operation sufficient inducement to grow many of their orchids under lights all year around (see REFERENCES, entries 1, 2 and 3). Because of the increasing use of artificial lighting, specialized fluorescent tubes and high-intensity lamps have been developed by the light-fixture industry for horticultural purposes. The array of both conventional and more innovative tubes and lamps on the market is a bit bewildering. Charles Marden Fitch, in his book, The Complete ok of Houseplants Under Lights (4), provides a helpful survey of the various lights, recommending, based on his many years of experience and experimenta-tion, the use of the broad-spectrum fluorescent tubes, or a combination of these and the standard "cool-white" tubes. Here at the A.O.S. Cambridge office, paphiopedilums and phalaenopsis flower quite satisfactorily under such a com-bination of lamps. The type of lights most frequently used for orchids, however, are fluorescent tubes, usually 48 or 96 inches long, 40 and 74 watts respectively. If you want supplemental lighting for a less-than-sunny window, two such tubes will probably be adequate. For orchids depending entirely on artificial light, stick to a mini-mum of four fluorescent tubes for good growth and flowering. This will provide adequate light intensities for low-light orchids on growing areas 18-22 inches wide. Fluorescent tubes should be set in fixtures on a minimum of 2-inch centers, as is the case here at the Cambridge office. These fixtures should be bracketed by reflectors, usually metal and painted or enameled white, which reflect emitted light, increasing the intensity of the light reaching the plants below. For the most efficient arrangement of tubes for larger and smaller areas, consult the Light Garden Primer, written by Jack Golding and published by the Indoor Light Gardening Society of America (6). All lights require electrical gadgetry and construction for their proper operation and support. For this I refer you to another one of the informative pamphlets published by the Indoor Light Gardening Society of America entitled Light Garden Construction - A Do-It-Yourself Manual, written by Phyllis Wolff Banucci (7). Those who do not wish to start from scratch may choose from one of the many "light garden" kits on the market today. Most conventional light set-ups for orchids are much like the one we have in the A.O.S. office, consisting of a self-standing, supporting metal frame and two tiers of light fixtures above and trays below. Here the potted orchids rest on a rigid, plastic lattice which permits drainage as it provides adequate support for the plants. This lattice covers wooden trays which are 4 inches deep, 4 feet long, 2 feet wide. These wooden trays are lined with standard polyethylene sheeting, two layers thick, to collect and hold the copious amounts of water given the orchids. 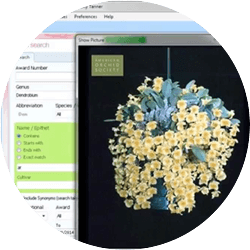 Recommendations for the ideal distance between lights and the tops of orchids vary in the literature, anywhere from 4 to 10 inches (4, 8, 9). This is based on the fact that light intensity decreases dramatically as the distance from the source of illumination increases. Were this the only consideration, one could possibly say, "the closer the better." But also keep in mind that plant tissue burns in contact with the hot, operating lights. Some space above the plants is necessary for observation and watering, for air circulation, and for the development of taller growths and flower spikes. The area of highest light intensities under fluorescent tubes is at dead-center, the light intensity dropping off fairly sharply towards the edges of the area illuminated. The closer the lights, the more confined the area of acceptable light intensity. Consult once again the Light Garden Primer for a more detailed explanation of the technical aspects of lighting, supported by many clarifying graphs (6). The distance between the mature paphiopedilums and phalaenopsis and the fluorescent tubes of the light garden at the A.O.S. office is about 12 inches. This may be a little high but it does result in the tray being adequately illuminated to the very edge, and it accommodates the spikes when the plants are in bloom. Growing a mixed collection of orchids of varying sizes and needs under lights demands a little ingenuity, and tinkering. Orchids of similar height can be segregated into separate tiers, and the fixtures raised or lowered as necessary. Higher-light-requiring plants can be placed towards the center of the trays, less demanding ones nearer the edges. Seedlings (and smaller plants), which are known in many cases to make more rapid growth under lights than under greenhouse conditions (10), can be grown at different heights on the same tray by the use of inverted pots. Orchids with adventuresome spikes can be removed before they collide with the burning lights, and enjoyed elsewhere. Or if you have a large number of spikes coming into flower (and adjustable fixtures), the lights can be raised temporarily to avoid trouble (11). Otherwise, watch your spikes carefully and train them out of harm's way (2). The length of time the lights should be on each day for successful growing and flowering of orchids is a subject of some debate, but 16-hour "days" seems to be the average recommendation, with possibly some reduction of a couple of hours or more for several months in the early winter for photoperiod-sensitive plants, or an increase of a couple hours for rapidly growing seedlings (4, 8, 9). As few popular orchid hybrids require longer nights and shorter days to flower, the beginning orchid grower is probably safe to stick to the same daylength year around as we do here because the paphs and phals seem to flower in response to a drop in night temperatures or a maturation of new growth, not to any change in light period. Inexpensive automatic timers are the easiest and most reliable way to set light duration. If you find that one of the members of your collection refuses to flower despite being content in every other respect, do not deprive your entire collection just to give it longer nights. Separate it from the rest of the collection to give it longer dark periods for a number of weeks, and see if it will respond. Proper care of your lights will also ensure good lighting for your orchids. Periodic cleaning is necessary because tubes attract dust while operating. Remove the tubes and clean them with a slightly moist cloth. All lights have a definite life-span, but fluorescent tubes for growing plants should be replaced well before they burn out. Fluorescent lights have been found to lose up to 30% of their rated output by the end of their expected lifespan. Most people knowledgeable in the field suggest, therefore, replacing the tubes within two years after installation (4, 8). Elaine Cherry in her excellent book Fluorescent Light Gardening recommends replacement of tubes operating on 16-hour days after 650 days or 1.8 years of use. To avoid any possible shock from the higher light intensities of new tubes, old lights should be replaced gradually, one tube per tier at a time, at one-week intervals. Write the installation date and calculated date of replacement on the tubes with a grease pen, as a reminder (8). A light garden can be set up almost anywhere, not being dependent on any natural sources of light. Many hobbyists growing under artificial light have made use of their basements (12). This frequently wasted space is a very suitable location for such a purpose, being out of the way and generally cooler and more moist than upstairs in the drying, heated or air-conditioned air. 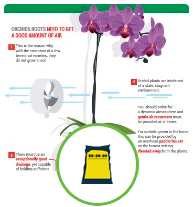 Humidifiers and fans help bring about a more suitable environment for your orchids no matter where you grow. Again, the more confined the space, the easier it will be to raise the humidity. Hobbyists have been known to enclose their light gardens, install fans and humidifiers, and even to provide cooling in order to grow a wide variety of orchids well (3). A consideration in locating your growing area should be its proximity to a water and drainage source. 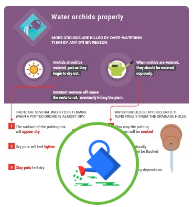 Orchid growers, unlike growers of other plants sensibly preferring soil, are cursed by the perverse tendency of orchids to be epiphytic, insisting on "an open, porous medium" which drains like the kitchen sink without the plumbing. While hobbyists with greenhouses can water away with a smug disregard for where the water goes after it travels through the plants and media, people growing orchids indoors are constantly laboring with the problem of water disposal, their homes under a continual threat of watery disaster. Wherever you grow indoors, gallons upon gallons of water must be drained and removed somehow if a catastrophe is not to result! Watering in the sink is fine for a small, starting collection, but more than likely you will soon find yourself in a predicament similar to ours here at the A.O.S. office. Unfortunately, the light garden located outside my office on the third floor of 84 Sherman Street is on the far end of the building from the sink. So the usual procedure is to snake a 75-foot hose around file cabinets, across the length of the office, and to attach it to a faucet hose-adapter at the sink. Other than possibly tripping an unwary staff member, the potential for calamity does not exist up to this point. But once the water is turned on, plenty of things can go wrong, and I have quite successfully determined what exactly they are. First of all, the turn-off valve may not be turned off at the other end, much to the dismay of those on the second floor as it begins, strangely enough, to rain indoors. Assuming that the valve is indeed closed, as it should be, the next potential tragedy involves the faucet hose-adapter which does have a tendency to gradually come loose under the weight of the hose, spontaneously creating a shower, with no drain, in the men's room. Watering itself, though a bit messy what with water inevitably splashing off leaves and onto the linoleum floors, is not terribly dangerous, as the collecting trays seem fairly sturdy. The real danger is in siphoning off this water into 2- or 3-gallon buckets and then carrying them back across the length of the building to be emptied at the sink. Several times I have actually slipped as I teetered across the wet floor with brimming buckets in both hands. And while I have not yet suffered personal harm, the linoleum floor is beginning to mysteriously curl up in places. No doubt a better procedure for water disposal has to be devised! Growing orchids indoors does present challenges not faced by those who have greenhouses. But, undeniably, artificial lighting does make it possible for many people to grow orchids who might not otherwise have the opportunity. What really matters is that all hobbyists, whether they grow outdoors, indoors or in a greenhouse, can expect to be rewarded for their efforts with flowering orchids if they see to it that all the essentials in growing are well provided for. Richard Peterson, Editor of the A.O.S. 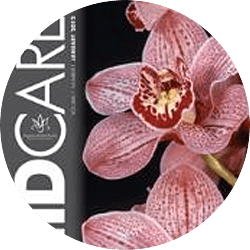 BULLETIN, has written a thorough pamphlet on orchid culture under lights (13) to help all those who grow under artificial light meet the needs of their orchids. The next article of this series will deal with other important aspects of orchid culture. 84 Sherman Street, Cambridge, Massachusetts 02140. Keen, James H. 1972. Orchids and Fluorescent Lights. Amer. Orchid Soc. Bull. 41(9): 796-800. Zoufaly, Howard W. 1980. Problems with Orchid Light Culture. Amer. Orchid Soc. Bull. 49(5): 514-521. Stiller, Joy and Ralph. 1980. 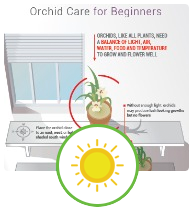 A System for Summer Survival of Cool-Growing Orchids. Amer. Orchid Soc. Bull. 49(3): 255-258. Fitch, Charles Marden. 1975. The Complete Book of Houseplants Under Lights. New York: Hawthorn Books, Inc.
Baer, Jo. 1971. Fluorescent Light Orchid Culture, I and II: A New Approach. Amer. Orchid Soc. Bull. 40: 786-790, 868-873. Golding, Jack. Light Garden Primer, Cultural Guide No. 5. New York: Indoor Light Gardening Society of America, Inc.
Banucci, Phyllis Wolff. 1976. Light Garden Construction, A Do-It-Yourself Manual, Cultural Guide No. 7. New York: Indoor Light Gardening Society of America, Inc.
Cherry, Elaine C. 1965. Fluorescent Light Gardening. Princeton: D. Van Nostrand Company, Inc.
Northen, Rebecca Tyson. 1976. Orchids as House Plants, Second Edition. New York: Dover Publications, Inc.
Ellison, Barbara and Marilyn B. Zimmer. 1974. Greenhouse versus Lights, A Comparison. Amer. Orchid Soc. Bull. 43(1): 972-976. Impola, Fern M. 1973. Orchids Under Lights in Northern Minnesota. Amer. Orchid Soc. Bull. 42(10): 881-887. 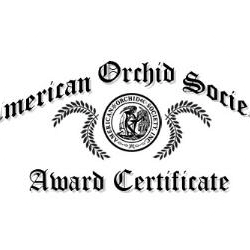 American Orchid Society, Inc. 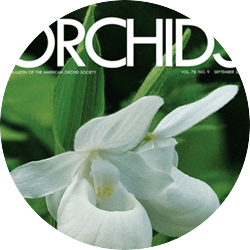 Growing Orchid Indoors, A selection of articles from the American Orchid Society Bulletin. Peterson, Richard. 1981. Orchid Culture Under Lights, Cultural Guide Series. New York: Indoor Light Gardening Society of America, Inc.